These printable coloring pages are great for coloring fun and for learning about different plant and animal species. 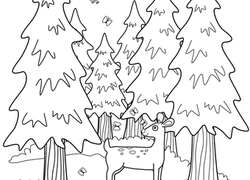 These printable coloring pages allow kids to learn about the great outdoors without the trip to the woods. Just print and get coloring. This is a forest without trees! Teach your child about the Petrified Forest with this worksheet, and talk about why we protect this colorful piece of land. Cat lovers, learn a bit about an interesting breed: the Norwegian Forest Cat! This coloring page comes complete with a few facts to read as you colour. Start learning a new language with a cute coloring page! Your child will get to practise phonics and spelling using a sight word in Russian. The Helmet Vanga in this coloring page is perched by its nest in a tropical forest. Print out this coloring page of Big Basin State Park redwoods and experience the magic of the forest. Your first grader will love to colour this bobcat mama carrying her kitten to safety through the forest. 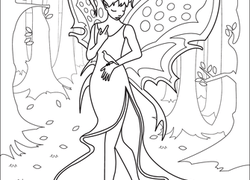 This coloring page features the mythical horned creature prancing in the forest. Share a honey badger coloring page with your child, and enjoy learning a fun fact about this awesome forest animal. Give him and his forest home some beautiful colors to look at. Give him some bright forest colors. Have a blast coloring a new forest animal with your child, and challenge him to read the fun fact about wild boars. If your child likes to colour outside the lines, give her creative control to complete the picture of a house in the forest. Teach your child about a new forest animal, the bobcat, with a fun coloring page, complete with a fun fact at the bottom. This bat coloring page features a bat in mid-flight through the forest. Have fun adding colour to this nocturnal creature and the night-time scene! Colour in this picture of a shrew tenrec, a rodent that lives in the forests of Madagascar. The wolf is one of the top predators in the Rocky Mountains. colour him shades of grey, black, and white to help him blend into the snowy forests.